Here are some of the better teas I've tried this month. They're all from Upton Tea Imports. I've tended to gravitate toward them lately because they have a wide selection ("420 varieties of loose tea") and offer much of what they sell in a sample size. After all, it's kind of disappointing to spring for a large quantity of tea, only to find out, right from the first cup, that you don't like it. Yuk, I say. If you've spent much time at this site, you're probably aware that I'm a tireless cheerleader for high-quality single-estate Assam varieties (no milk or sugar, please). I even dedicated the entire month of March 2006 to Assam teas. One variety that stood out among the many I sampled back then was Hattialli Estate GFBOP SPL, which I reviewed here. I recently finished off a 125-gram package and find myself longing for more. With all my focus on Assam, I tend to sometimes forget that are other black teas in the world - like in China, for instance. I decided to try out a sample of Organic China Yunnan Shui Jiu a few weeks ago and I liked it so much that I ordered a larger quantity. I'm not generally a fan of smoky teas, but this one has just a faint hint of that and it comes across quite well. I tend to favor black teas, but I'm certainly not averse to a good green now and then. 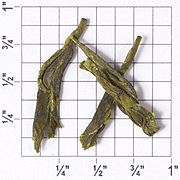 Long-Jing (Lung-Ching) Green (Superfine) is what I would call a good green and one that's definitely worth looking into.